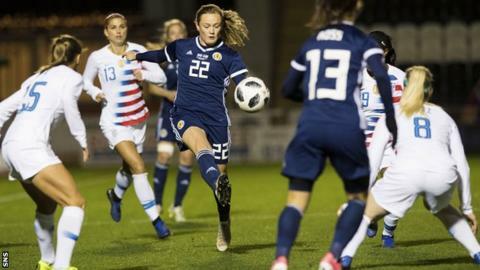 Scotland women's confidence is "sky high" but Erin Cuthbert insists Shelley Kerr's side are "not getting ahead of ourselves". The Scots defeated Brazil - ranked 10th in the world - in last week's friendly. Kerr's team will take on England, Japan and Argentina at the World Cup in June, after their final pre-tournament friendly against Jamaica next month. "I've never played at Hampden before so it would be a special occasion for me and my family," said Cuthbert. "You saw the result we got against Brazil so hopefully that will spur as many people through the gates as possible and can inspire young girls. "We've had good results against good teams. We just narrowly lost out to the USA but played very well so the next step for us was working out how to beat the best teams. "We've managed to do that and it's given us a lot of confidence but we're not getting ahead of ourselves because we know we have a very tough group ahead of us." The World Cup is not the only major tournament Cuthbert is involved in this year, with the Chelsea forward hoping to feature against Lyon in the Champions League semi-finals later this month. "I think having that experience on the European stage is only going to help me when I come into the national team," added Cuthbert, who helped make the draw for this year's Women's Under-19 European Championship in Glasgow. "When I train, I train at a really high level and to be able to sustain that every day is only going to be good for the national team. "There are so many girls playing professionally in our national team now, that when we come together it's at a very high standard. The competition for places is fierce."